A Nigerian guy identified as Charles Ebuka Umennadi has lambasted the "lazy boys in the village who don't know how to hunt animals". According to him, there is money in hunting animals and selling them to restaurant owners to use in making pepper soup. 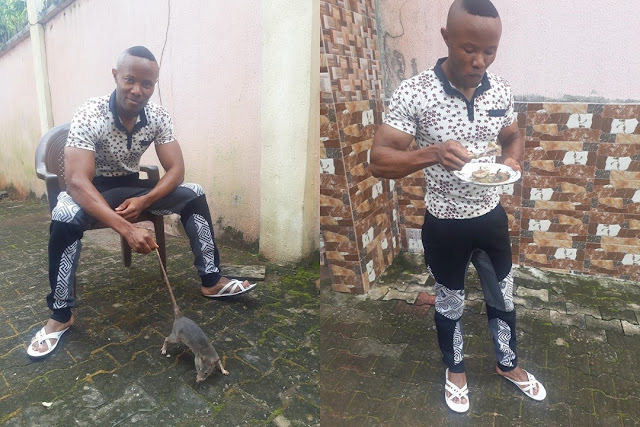 The young man also showed off a huge grasscutter /bush rat he caught and killed as he used it in making pepper soup for himself. It's really funny, nothing changes, everything looks the same, feels the same, tastes the same, even smells the same.. These boys don't know they can hunt these animals, sell them to pepper soup joint owners and raise raw cash the way we did during our own time to raise sch fees and pocket money, all they're looking for now is to work is pure water factory where they're paid 3k a month instead of hunting for grass cutter which can earn them up to 4-6k a day. The Igwe must hear this..